A GMO (genetically modified organism), also know as a GE (genetically engineered) or transgenic organism, is created by scientists in a laboratory where they insert genes into an organism to create new traits. In the United States, GMOs are not labeled. They are in over 75% of processed supermarket foods in ingredients like soy lecithin, canola, corn syrup, and cotton seed oil. Genetic engineering is completely different from traditional breeding. In traditional breeding it is possible to mate a pig with another pig to get a new variety, but is not possible to mate a pig with a potato or a mouse. Even when species that may seem to be closely related do succeed in breeding, the offspring are usually infertile—a horse, for example, can mate with a donkey, but the offspring (a mule) is sterile. With genetic engineering, scientists can breach species barriers set up by nature. For example, they have spliced fish genes into tomatoes. Spider/Goat – taking a gene from a spider that leads to the production of spider web and putting it into goats so the goats can then be milked for the spider web protein. Fish/Strawberries – taking a gene from an Arctic flounder and putting it into a strawberry to try to make it frost-resistant. Corn/Human – taking a human gene and putting it into corn so that the corn contains human antibodies that attack sperm. 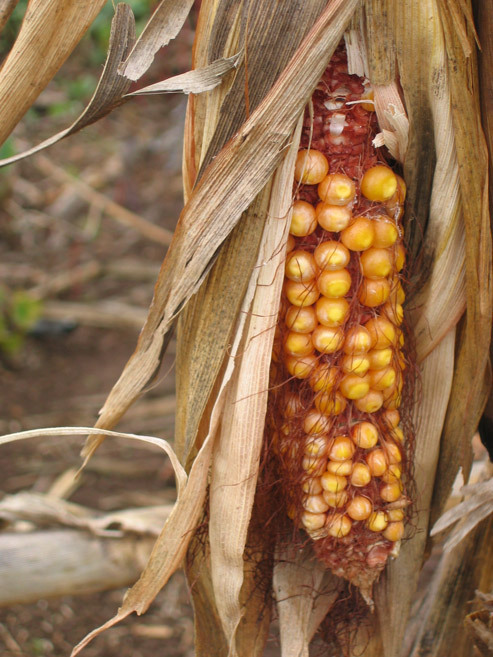 The idea is to develop the corn as a plant-gel contraceptive that kills sperm on contact. Are GMOs grown in Hawaii? Hill, J.A., A. Kiessling, R.H. Devlin. 2000. Coho salmon (Oncorhynchus kisutch) GE for a growth hormone gene construct exhibit increased rates of muscle hyperplasia and detectable levels of gene expression. Can. J. Fish. Aquat. Sci. 57: 939-50. In “Elements of Precaution: Recommendations for the Regulation of Food Biotechnology in Canada,” The Royal Society of Canada, Ottawa, January 2001, p.182, http://www.rsc.ca/index.php?page_id=119. Lindstrom, C.D., T. van Do, I. Hordvik, C. Endresen, S. Elsayed. 1996. Cloning of two distinct cDNAs encoding parvalbumin, the major allergen of Atlantic salmon salmo salar. Scan. J. Immunol. 44: 335-44. Vanessa E. Prescott, Peter M. Campbell, Andrew Moore, Joerg Mattes, Marc E. Rothenberg, Paul S. Foster, T. J. V. Higgins, and Simon P. Hogan, “Transgenic Expression of Bean-Amylase Inhibitor in Peas Results in Altered Structure and Immunogenicity,” Agric. Food Chem., 53 (23), 9023 -9030, 2005.